she wears flowers: "Sew" Exciting!! I'm so excited to be hosting this new sewing series with Stacy at Not JUST a Housewife! Of course, I'd love for you to follow along. 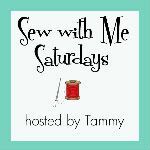 Just click on the "Sew with Me Saturdays" button in my sidebar to be taken directly to Not JUST a Housewife. If you have any suggestions for things you would like to me to post about in this series, let me have 'em! I'd love to know if you want to learn how to make something specific (insert your idea) or if you would like to learn new sewing techniques or even learn basic sewing techniques. Just leave a comment with your suggestions. I aim to please! Yay for you! That's BIG!! Your readership is going to explode! Congrats!! Thats awesome! Sounds like fun. Can't wait to see what you guys come up with! I just saw this yesterday over at Not Just a Housewife! I was so excited to see your name. How very fun. I'll be checking it out. i would love to learn how to make cute covers to go over boring everyday things. like office chairs or ipod speakers. love your blog and i'm so excited to hear you on not JUST a housewife!